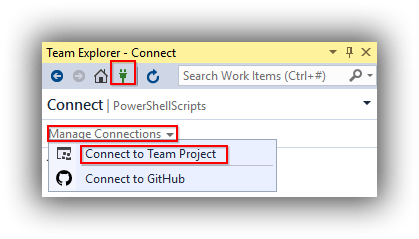 In the previous post in this series we covered using Release Management to deploy PowerShell DSC scripts to target nodes that both configured the nodes for web and database roles and then deployed our sample application. With this done we are now ready to do useful work with our deployment pipeline, and the big task for many teams is going to be running automated acceptance tests to check that previously developed functionality still works as expected as an application undergoes further changes. I covered how to create a page object model framework for running Selenium web tests in my previous blog series on continuous delivery here. The good news is that nothing much has changed and the code still runs fine, so to learn about how to create a framework please refer to this post. However one thing I didn't cover in the previous series was how to use SpecFlow and Selenium together to write business readable web tests and that's something I'll address in this series. 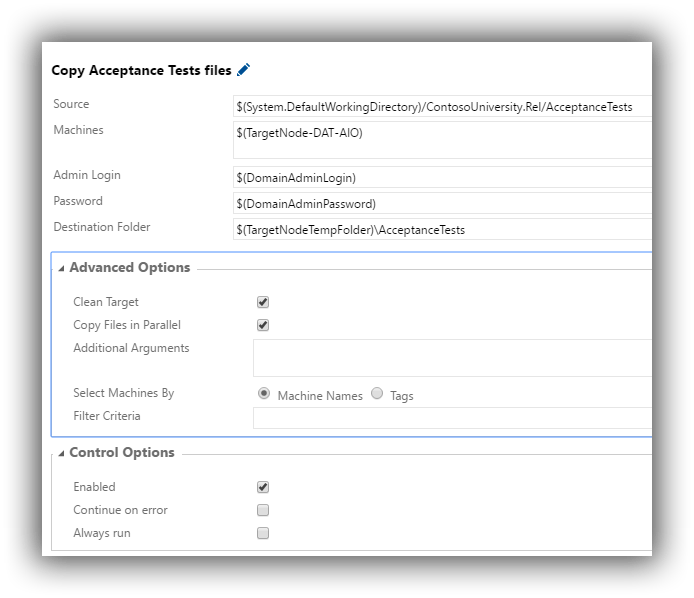 Specifically, in this post I'll cover getting acceptance tests working as part of the deployment pipeline and in the next post I'll show how to integrate SpecFlow. The acceptance tests are written using Selenium which is able to automate ‘driving' a web browser to navigate to pages, fill in forms, click on submit buttons and so on. Whilst these tests are created on and thus able to run on developer workstations the typical scenario is that the number of tests quickly mounts making it impractical to run them locally. In any case running them locally is of limited use since what we really want to know is if checked-in code changes from team members have broken any tests. The solution is to run the tests in an environment that is part of the deployment pipeline. In this blog series I call that the DAT (development automated test) environment, which is the first stage of the pipeline after the build process. 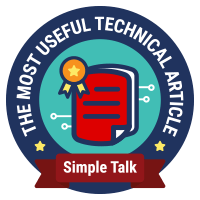 As I've explained previously in this blog series, the DAT environment should be configured in such a way as to minimise the possibility of tests failing due to factors other than code issues. I solve this for web applications by having the database, web site and test browser all running on the same node. Download the code that accompanies this post from my GitHub site here. Unblock and unzip the solution to a convenient location and then build it to restore NuGet packages. In ContosoUniversity.Database open ContosoUniversity.publish.xml and then click on Publish to create the ContosoUniversity database in LocalDB. Run ContosoUniversity.Web (and in so doing confirm that Contoso University is working) and then leaving the application running in the browser switch back to Visual Studio and from the Debug menu choose Detatch All. This leaves IIS Express running which FireFox needs to be able to navigate to any of the application's URLs. From the Test menu navigate to Playlist > Open Playlist File and open AutoWebTests.playlist which lives under ContosoUniversity.Web.AutoTests. 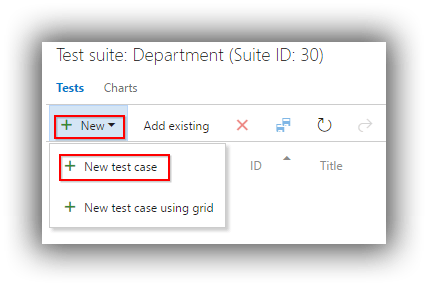 In Test Explorer two tests (Can_Navigate_To_Departments and Can_Create_Department) should now appear and these can be run in the usual way. FireFox should open and run each test which will hopefully turn green. The good news for those of us working in the VSTS and TFS 2015 worlds is that test controllers are a thing of the past because Agents for Microsoft Visual Studio 2015 handle communicating with VSTS or TFS 2015 directly. 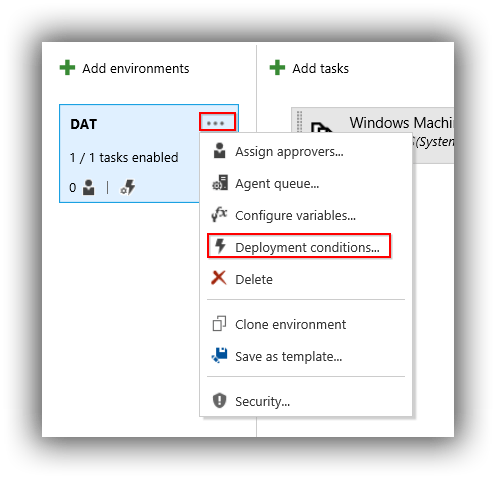 The agent needs to be deployed to the target node and this is handled by adding a Visual Studio Test Agent Deployment task to the DAT environment. The configuration of this task is very straightforward (see here) however you will probably want to create a dedicated domain service account for the agent service to run under. 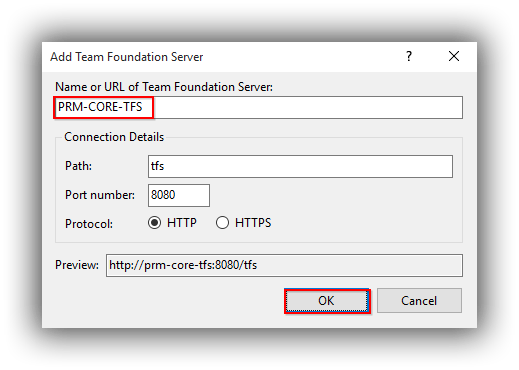 The process is slightly different between VSTS and TFS 2015 Update 2.1 in that in VSTS the machine details can be entered directly in the task whereas in TFS there is a requirement to create a Test Machine Group. As you will see though there are many more options that can be configured -- see the help page here for details. Before you create a build to test these setting out you will need to make sure that the node where the tests are to be run from is specified in Driver.cs which lives in ContosoUniversity.Web.SeFramework. You will also need to ensure that FireFox is installed on this node. I've been struggling to reliably automate the installation of FireFox which turned out to be just as well because I was trying to automate the installation of the latest version from the Mozilla site. This turns out to be a bad thing because the latest version at time of writing (47.0) doesn't work with the latest (at time of writing) version of Selenium (2.53.0). Automation installation efforts for FireFox therefore need to centre around installing a Selenium-compatible version which makes things easier since the installer can be pre-downloaded to a known location. I ran out of time and installed FireFox 46.1 (compatible with Selenium 2.53.0) manually but this is something I'll revisit. Disabling automatic updates in FireFox is also essential to ensure you don't get out of sync with Selenum. The first question you might ask about the Test Plan method is why bother if the Test Assembly method works? Of course, if the Test Assembly method gives you what you need then feel free to stick with that. However you might need to use the Test Plan method if a test plan already exists and you want to continue using it. Another reason is the possibility of more flexibility in choosing which tests to run. For example, you might organise your tests in to logical areas using static suites and then use query-based suites to choose subsets of tests, perhaps with the use of tags. Use the green cross to create a new test plan called Acceptance Tests. Making a note of the test case IDs, switch to Visual Studio and in Team Explorer > Work Items search for each test case in turn to open it for editing. 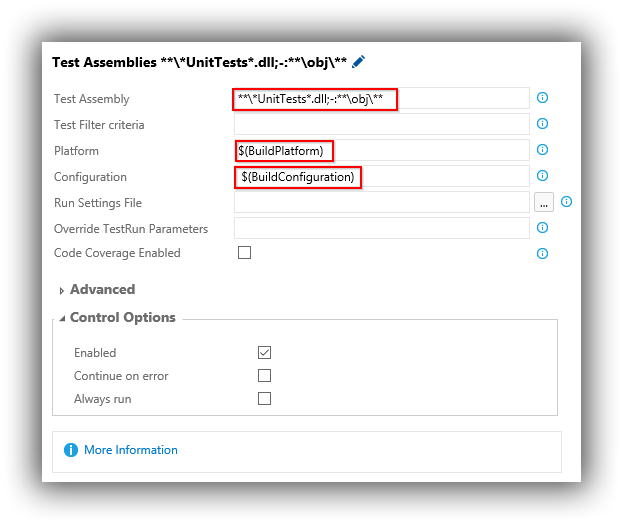 With the configuration complete trigger a new release and if everything has worked you should be able to navigate to Test > Runs and see output similar to the Test Assembly method. That's it for now. 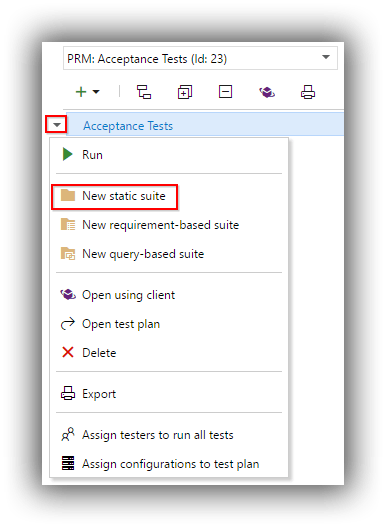 In the next post in this series I'll look at adding SpecFlow in to the mix to make the acceptance tests business readable. 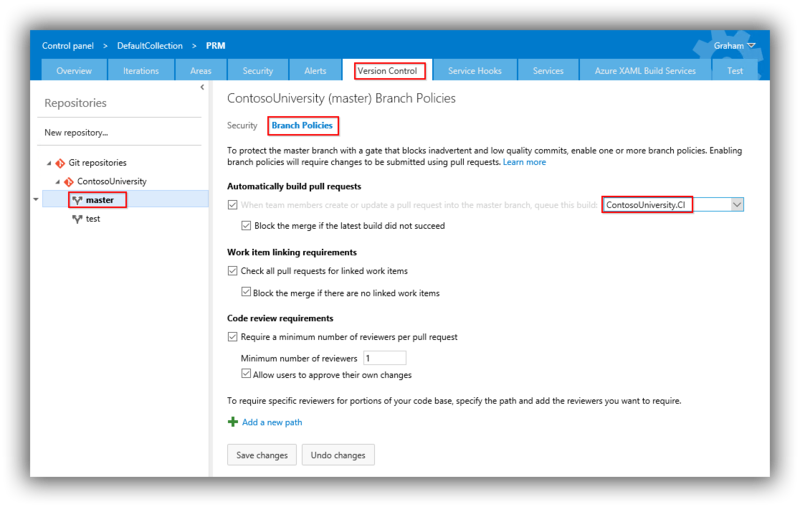 At this point in my blog series on Continuous Delivery with TFS / VSTS we have finally reached the stage where we are ready to start using the new web-based release management capabilities of VSTS and TFS. 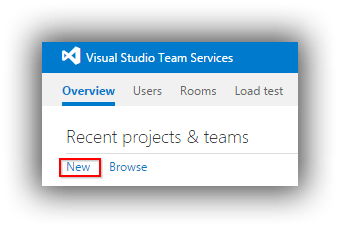 The functionality has been in VSTS for a little while now but only came to TFS with Update 2 of TFS 2015 which was released at the end of March 2016. Don't tell my wife but I'm having a torrid love affair with the new TFS / VSTS Release Management. It's flippin' brilliant! Compared to the previous WPF desktop client it's a breath of fresh air: easy to understand, quick to set up and a joy to use. Sure there are some improvements that could be made (and these will come in time) but for the moment, for a relatively new product, I'm finding the experience extremely agreeable. So let's crack on! The previous posts in this series set the scene for this post but I'll briefly summarise here. 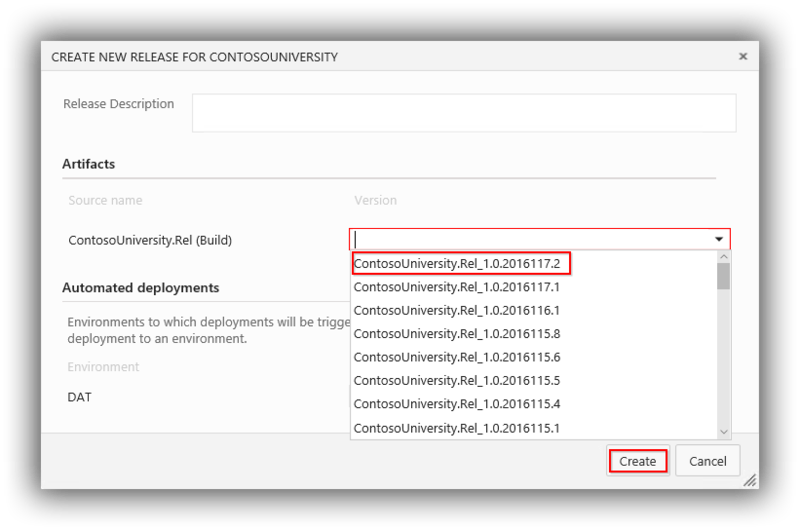 We'll be deploying the Contoso University sample application which consists of an ASP.NET MVC website and a SQL Server database which I've converted to a SQL Server Database Project so deployment is by DACPAC. We'll be deploying to three environments (DAT, DQA and PRD) as I explain here and not only will we be deploying the application we'll first be making sure the environments are correctly configured with PowerShell DSC using an adaptation of the procedure I describe here. 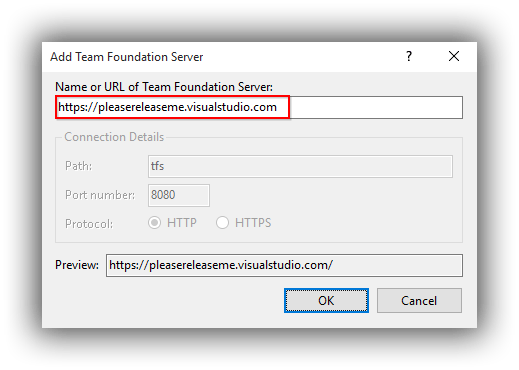 My demo environment in Azure is configured as a Windows domain and includes an instance of TFS 2015 Update 2 which I'll be using for this post as it's the lowest common denominator, although I will point out any VSTS specifics where needed. We'll be deploying to newly minted Windows Server 2012 R2 VMs which have been joined to the domain, configured with WMF 5.0 and had their domain firewall turned off -- see here for details. (Note that if you are using versions of Windows server earlier than 2012 that don't have remote management turned on you have a bit of extra work to do.) 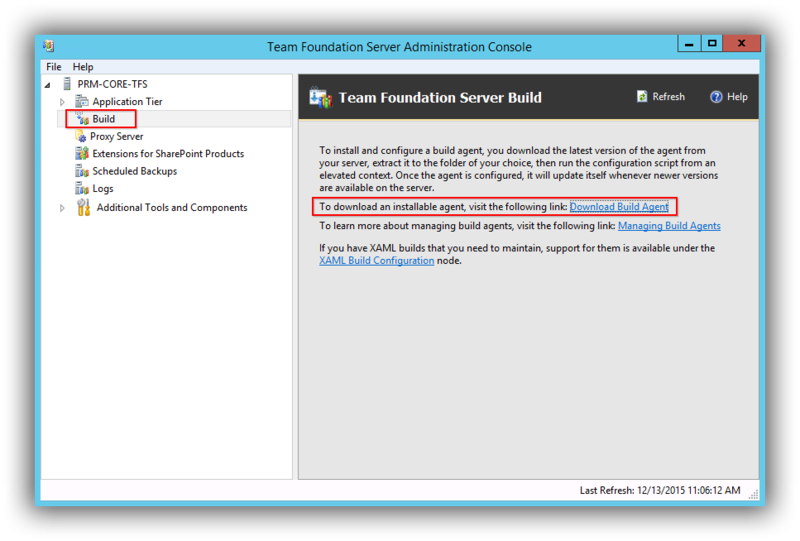 My TFS instance is hosting the build agent and as such the agent can ‘see' all the machines in the domain. I'm using Integrated Security to allow the website to talk to the database and use three different domain accounts (CU-DAT, CU-DQA and CU-PRD) to illustrate passing different credentials to different environments. I assume you have these set up in advance. As far as development tools are concerned I'm using Visual Studio 2015 Update 2 with PowerShell Tools installed and Git for version control within a TFS / VSTS team project. It goes without saying that for each release I'm building the application only once and as part of the build any environment-specific configuration is replaced with tokens. These tokens are replaced with the correct values for that environment as that same tokenised build moves through the deployment pipeline. A key concept I am promoting in this blog post series is that configuring the servers that your application will run on should not be an afterthought and neither should it be a manual click-through-GUI process. Rather, you should be configuring your servers through code and that code should be written at the same time as you write your application code. Furthermore the server configuration code should live with your application code. To start then we need to configure Contoso University for this way of working. If you are following along you can get the starting point code from here. Open the ContosoUniversity solution in Visual Studio and add new folders called Deploy to the ContosoUniversity.Database and ContosoUniversity.Web projects. $cmd= "& 'C:\Program Files\Microsoft SQL Server\Client SDK\ODBC\110\Tools\Binn\sqlcmd.exe' -S localhost -i 'C:\temp\Database\Deploy\Create login and database user.sql' "
$customModulesDestination = Join-Path $env:SystemDrive "\Program Files\WindowsPowerShell\Modules"
In ContosoUniversity.Web\Deploy create two new files: Website.ps1 and WebDscResources.ps1. Name = ".NET v4.5 Classic"
In ContosoUniversity.Database\Scripts move Create login and database user.sql to the Deploy folder and remove the Scripts folder. Make sure all these files have their Copy to Output Directory property set to Copy always. For the files in ContosoUniversity.Database\Deploy the Build Action property should be set to None. In the case of the database component I'm using the xDatabase custom DSC resource to deploy the DACPAC. I came across a problem with this resource where it wouldn't install the DACPAC using domain credentials, despite the credentials having the correct permissions in SQL Server. I ended up having to install SQL Server using Mixed Mode authentication and installing the DACPAC using the sa login. I know, I know! My preferred technique for deploying website files is plain xcopy. For me the requirement is to clear the old files down and replace them with the new ones. After some experimentation I ended up with code to stop IIS, remove the web folder, copy the new web folder from its temp location and then restart IIS. Both the database and website have files with configuration tokens that needed replacing as part of the deployment. I'm using the xReleaseManagement custom DSC resource which takes a hash table of tokens (in the __TOKEN_NAME__ format) to replace. In order to use custom resources on target nodes the custom resources need to be in place before attempting to run a configuration. I had hoped to use a push server technique for this but it was not to be since for this post at least I'm running the DSC configurations on the actual target nodes and the push server technique only works if the MOF files are created on a staging machine that has the custom resources installed. Instead I'm copying the custom resources to the target nodes just prior to running the DSC configurations and this is the purpose of the DbDscResources.ps1 and WebDscResources.ps1 files. The custom resources live on a UNC that is available to target nodes and get there by simply copying them from a machine where they have been installed (C:\Program Files\WindowsPowerShell\Modules is the location) to the UNC. 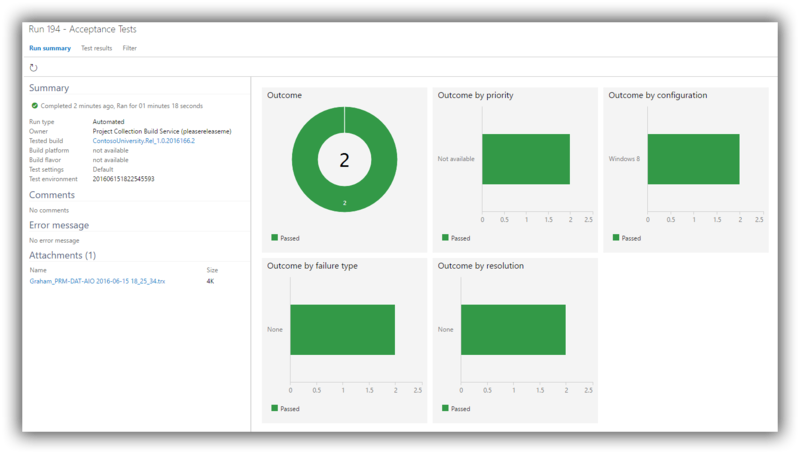 With the Visual Studio now configured (don't forget to commit the changes) we now need to create a build to check that initial code quality checks have passed and if so to publish the database and website components ready for deployment. 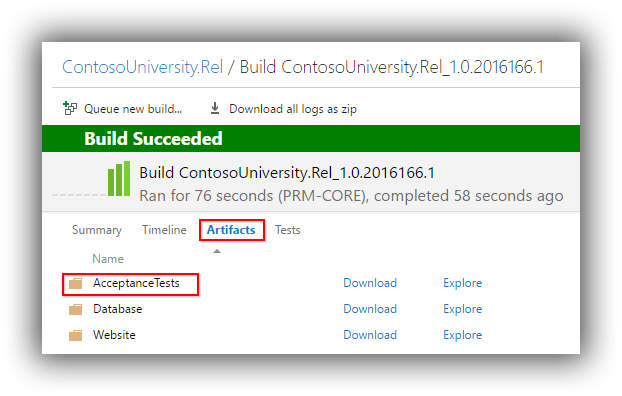 Create a new build definition called ContosoUniversity.Rel and follow this post to configure the basics and this post to create a task to run unit tests. Note that for the Visual Studio Build task the MSBuild Arguments setting is /p:OutDir=$(build.stagingDirectory) /p:UseWPP_CopyWebApplication=True /p:PipelineDependsOnBuild=False /p:RunCodeAnalysis=True. This gives us a _PublishedWebsites\ContosoUniversity.Web folder (that contains all the web files that need to be deployed) and also runs the transformation to tokensise Web.config. Additionally, since we are outputting to $(build.stagingDirectory) the Test Assembly setting of the Visual Studio Test task needs to be $(build.stagingDirectory)\**\*UnitTests*.dll;-:**\obj\**. At some point we'll want to version our assemblies but I'll return to that in a another post. 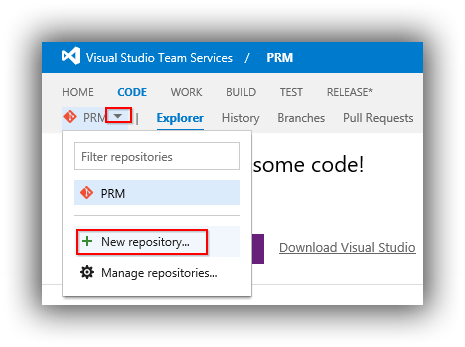 One important step that has changed since my earlier posts is that the Restore NuGet Packages option in the Visual Studio Build task has been deprecated. 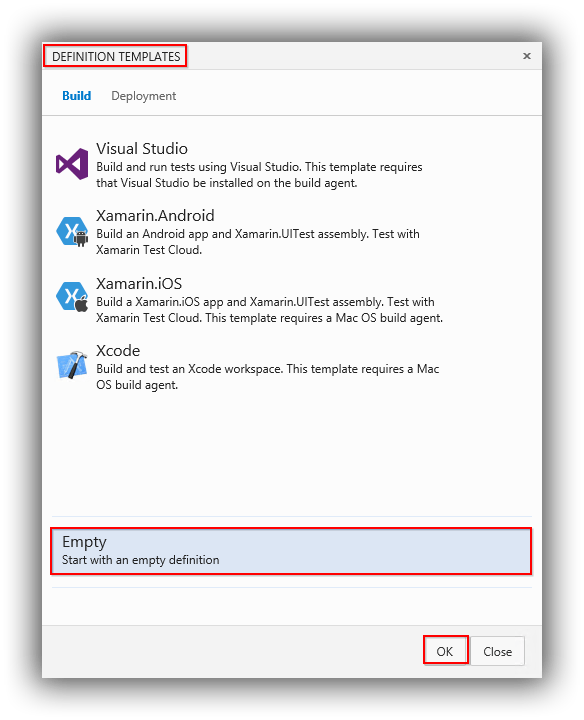 The new way of doing this is to add a NuGet Installer task as the very first item and then in the Visual Studio Build task (in the Advanced section in VSTS) uncheck Restore NuGet Packages. Provide a Definition name -- ContosoUniversity for example. Change the name of the environment that has been added to DAT. 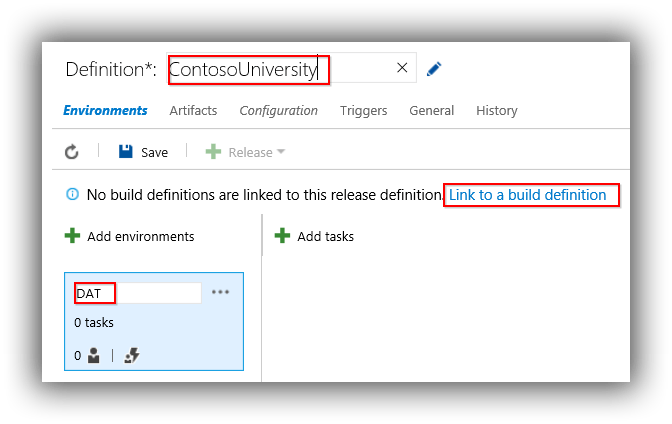 Click on Link to a build definition to link the release to the ContosoUniversity.Rel build definition. Edit the names (use the pencil icon) to read Copy Database files and Copy Website files respectively. 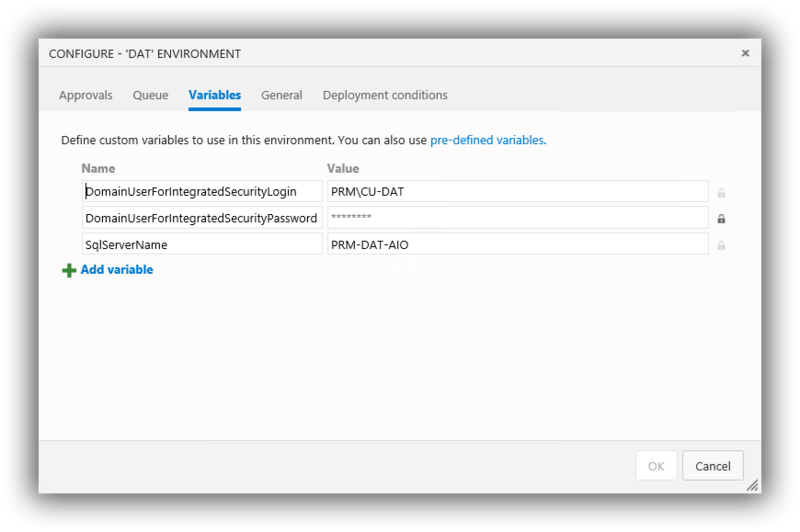 Click the ellipsis in the DAT environment and choose Deployment conditions. Change the Trigger to After release creation and click OK to accept. If the release succeeds a C:\temp folder containing the artifact folders will have been created on on PRM-DAT-AIO. If the release fails switch to the Logs tab to troubleshoot. Permissions and whether the firewall has been configured to allow WinRM are the likely culprits. To preserve my sanity I do everything as domain admin and I have the domain firewall turned off. The usual warnings about these not necessarily being best practices in non-test environments apply! Add two PowerShell on Target Machines tasks to alternately follow the Windows Machine File Copy tasks. Edit the names (use the pencil icon) to read Configure Database and Configure Website respectively. Go ahead and trigger a new release. 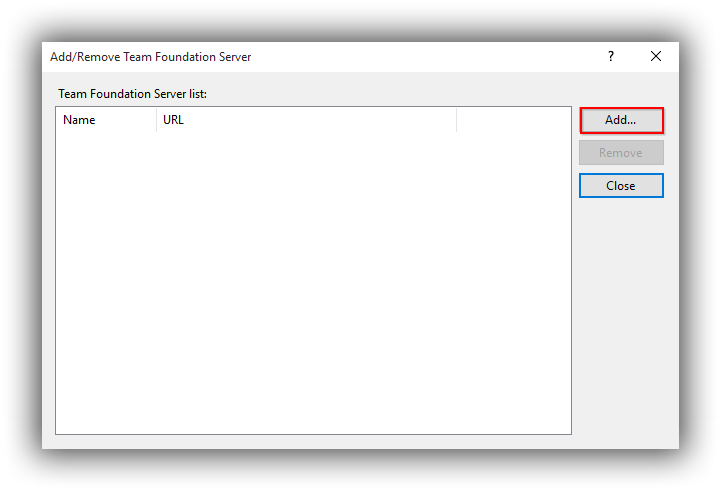 This should result in the PowerShell scripts being executed on the target node and IIS and SQL Server being installed, as well as the Contoso University application. You should be able to browse the application at http://prm-dat-aio. Result! Although we now have a working release for the DAT environment it will hopefully be obvious that there are serious shortcomings with the way we've configured the release. Passwords in plain view is one issue and repeated values is another. The latter issue is doubly of concern when we start creating further environments. The other tasks are obviously configured in a similar way, and notice how some fields use more than one variable. Nothing has a actually changed by replacing hard-coded values with variables so triggering another release should be successful. In the DAT environment click on the ellipsis and select Clone environment and name it DQA. Change the two database tasks so the Machines property is $(TargetNode-DQA-SQL). Change the two website tasks so the Machines property is $(TargetNode-DQA-IIS). Click on the padlock icon for the DomainUserForIntegratedSecurityPassword variable to clear it then re-enter the password and click the padlock icon again to make it a secret. Don't miss this! 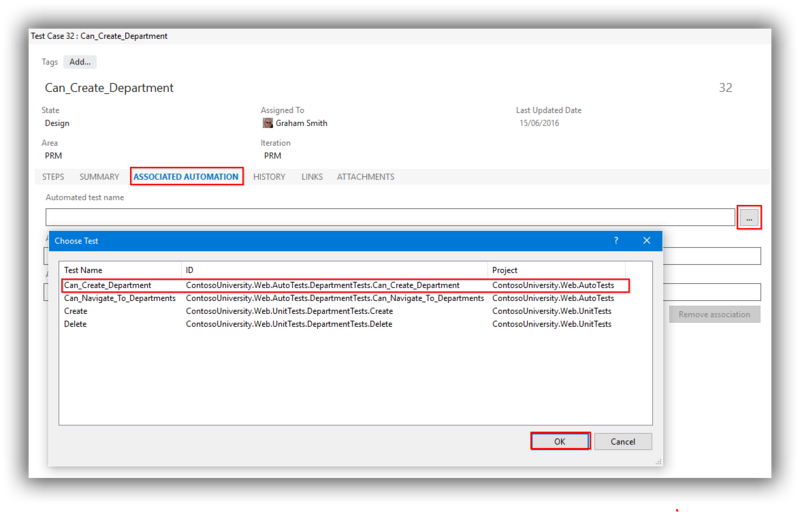 In the DQA environment click on the ellipsis and select Deployment conditions and set Trigger to No automated deployment. This is a great way to check that variables are the correct values for the different environments. There's plenty more functionality in Release Management that I haven't described but that's as far as I'm going in this post. One message I do want to get across is that the procedure I describe in this post is not meant to be a statement on the definitive way of using Release Management. Rather, it's designed to show what's possible and to get you thinking about your own situation and some of the factors that you might need to consider. As just one example, if you only have one application then the Visual Studio solution for the application is probably fine for the DSC code that installs IIS and SQL Server. However if you have multiple similar applications then almost certainly you don't want all that code repeated in every solution. Moving this code to the point at which the nodes are created could be an option here -- or perhaps there is a better way! That's it for the moment but rest assured there's lots more to be covered in this series. If you want the final code that accompanies this post I've created a release here on my GitHub site. So far in this blog post series on Continuous Delivery with TFS / VSTS we have gradually worked our way to the position of having a build of our application which is almost ready to be deployed to target servers (or nodes if you prefer) in order to conduct further testing before finally making its way to production. This brings us to the question of how these nodes should be provisioned and configured. In my previous series on continuous delivery deployment was to nodes that had been created and configured manually. However with the wealth of automation tools available to us we can -- and should -- improve on that. 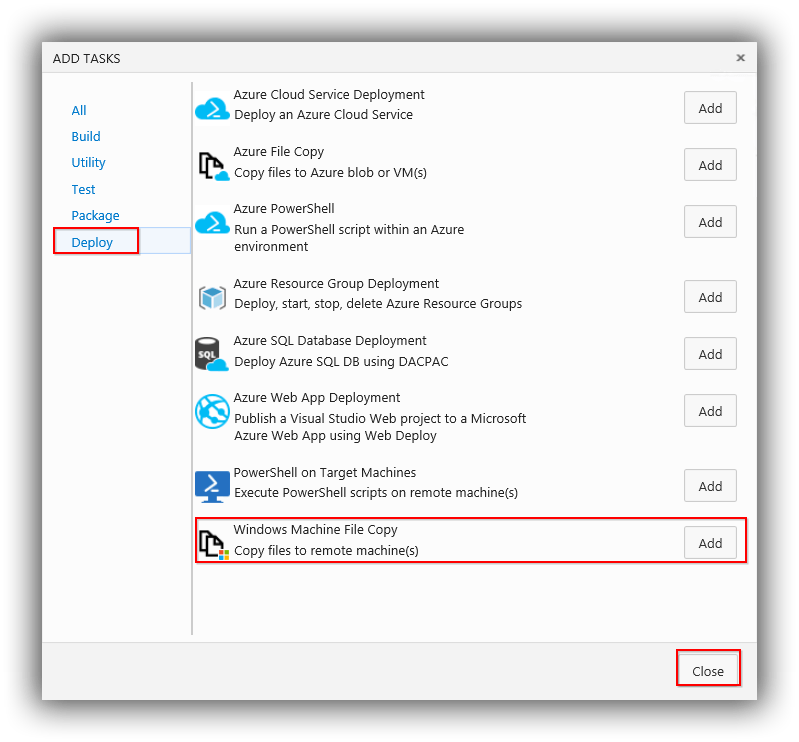 This post explains how to achieve the first of those -- provisioning a Windows Server virtual machine using Azure Resource Manager templates. A future post will deal with the configuration side of things using PowerShell DSC. Before going further I should point out that this post is a bit different from my other posts in the sense that it is very specific to Azure. If you are attempting to implement continuous delivery in an on premises situation chances are that the specifics of what I cover here are not directly usable. Consequently, I'm writing this post in the spirit of getting you to think about this topic with a view to investigating what's possible for your situation. 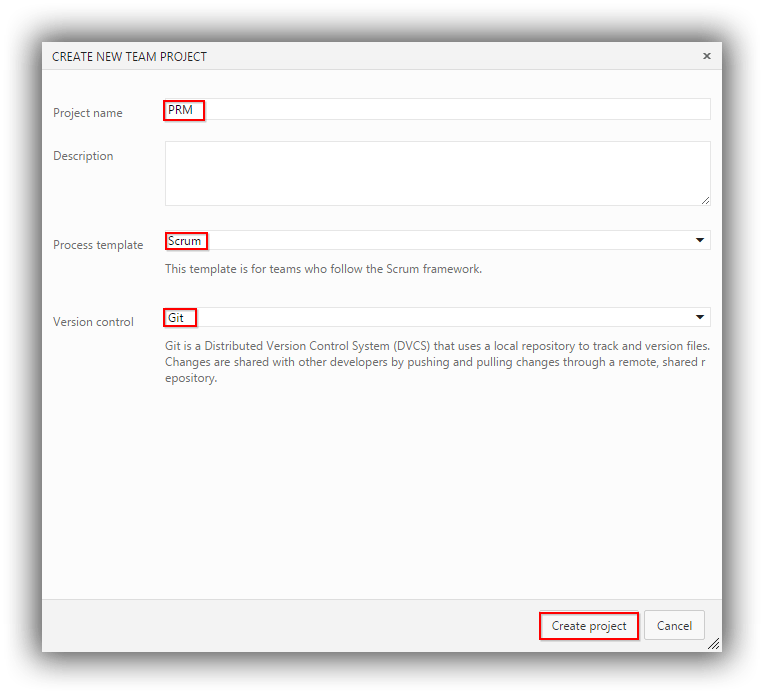 Additionally, if you are not in the continuous delivery space and have stumbled across this post through serendipity I do hope you will be able to follow along with my workflow for creating templates. Once you get past the Big Picture section it's reasonably generic and you can find the code that accompanies this post at my GitHub repository here. DAT -- development automated test where automated UI testing takes place. This will be an ‘all in one' VM hosting both SQL Server and IIS. Why have an all-in-one VM? It's because the purpose of this environment is to run automated tests, and if those tests fail we want a high degree of certainty that it was because of code and not any other factors such as network problems or a database timeout. To achieve that state of certainty we need to eliminate as many influencing variables as possible, and the simplest way of achieving that is to have everything running on the same VM. It breaks the rule about early environments reflecting production but if you are in an on premises situation and your VMs are on hand-me-down infrastructure and your network is busy at night (when your tests are likely running) backing up VMs and goodness knows what else then you might come to appreciate the need for an all-in-one VM for automated testing. DQA -- development quality assurance where high-value manual testing takes place. This really does need to reflect production so it will consist of a database VM and a web server VM. PRD -- production for the live code. It will consist of a database VM and a web server VM. The advantage of using resource groups as containers is that an environment can be torn down very easily. This makes more sense when you realise that it's not just the VM that needs tearing down but also storage accounts, network security groups, network interfaces and public IP addresses. 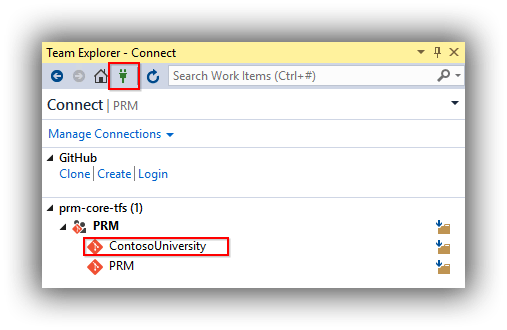 Create a Model VM in Azure Portal. The ARM templates that Microsoft provide tend to result in infrastructure that have different internal names compared with the same infrastructure created through the Azure Portal. I like how the portal names things and in order to help replicate that naming convention for VMs I find it useful to create a model VM in the portal whose components I can examine via the Azure Resource Explorer. 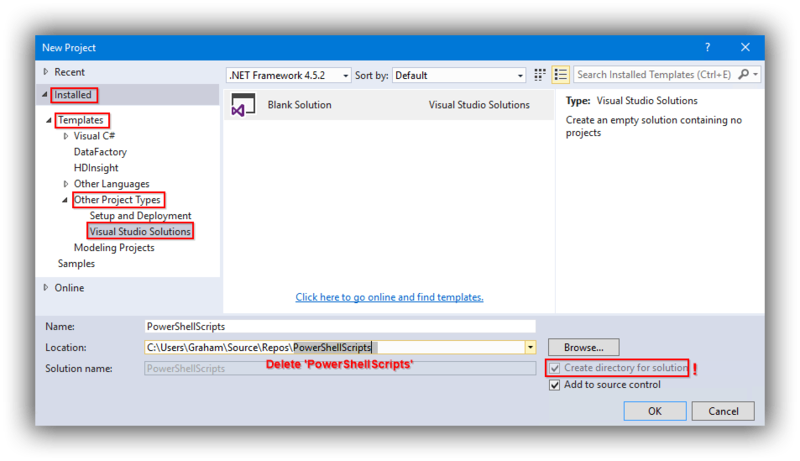 Create a Visual Studio Solution. Probably the easiest way to work with ARM templates is in Visual Studio. 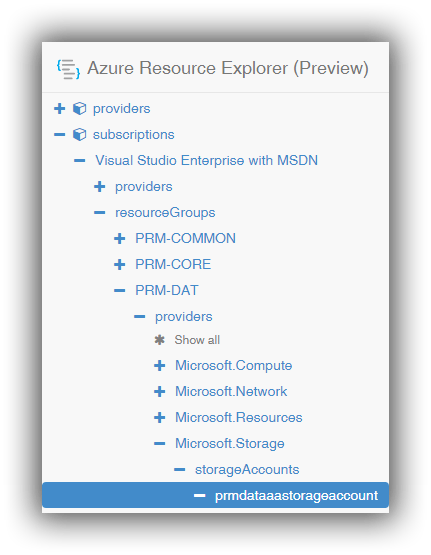 You'll need the Azure SDK installed to see the Azure Resource Group project template -- see here for more details. 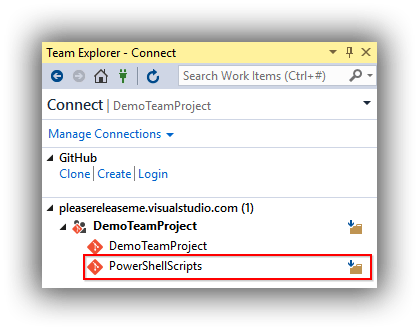 We'll also be using Visual Studio to deploy the templates using PowerShell and for that you'll need the PowerShell Tools for Visual Studio extension. If you are new to this I have a Getting Started blog post here. 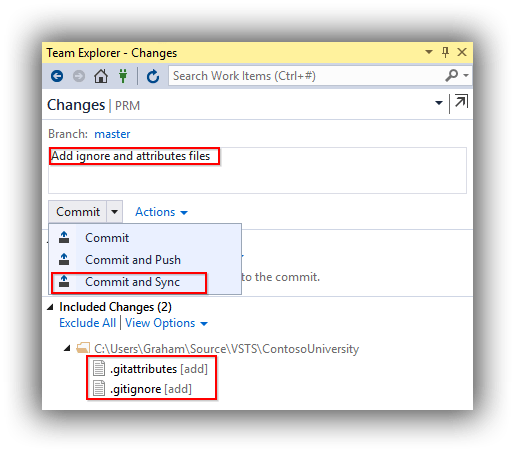 We'll be using Git in either TFS or VSTS for version control but if you are following this series we've already covered that. Perform an Initial Deployment. There's nothing worse than spending hours coding only to find that what you're hoping to do doesn't work and that the problem is hard to trace. The answer of course is to deploy early and that's the purpose of this step. 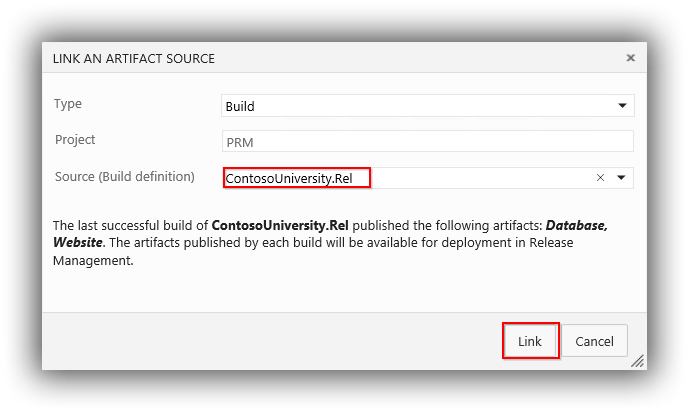 Build the Deployment Template Resource by Resource Using Hard-coded Values. The Microsoft templates really go to town when it comes to implementing variables and parameters. That level of detail isn't required here but it's hard to see just how much is required until the template is complete. My workflow involves using hard-coded values initially so the focus can remain on getting the template working and then refactoring later. Refactor the Template with Parameters, Variables and Functions. For me refactoring to remove the hard-coded values is one of most fun and rewarding parts of the process. There's a wealth of programming functionality available in ARM templates -- see here for all the details. 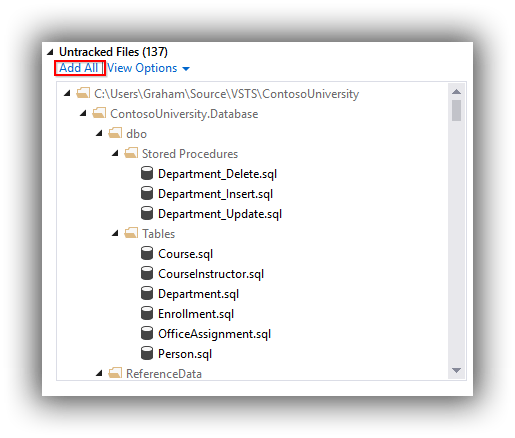 Use the Template to Create Multiple VMs. We've proved the template can create a single VM -- what about multiple VMs? This section explores the options. That's enough overview -- time to get stuck in! Create a resource group called PRM-DAT in your preferred location -- in my case West Europe. 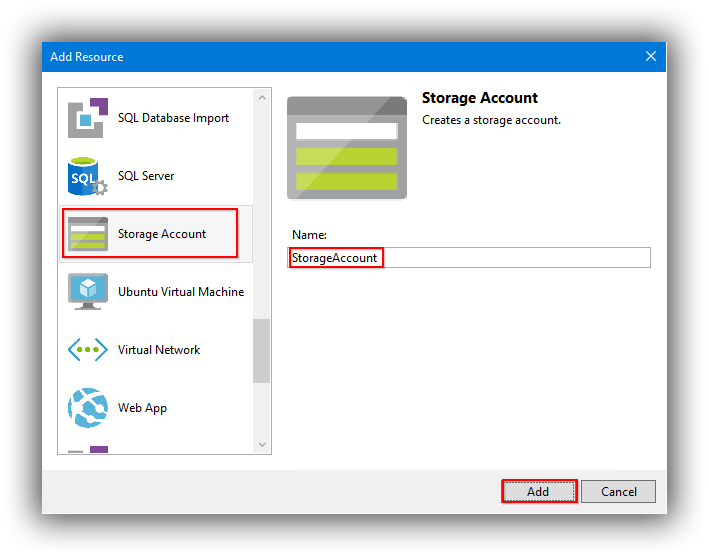 Create a standard (Standard-LRS) storage account in the new resource group -- I named mine prmdataaastorageaccount. Don't enable diagnostics. Create a Windows Server 2012 R2 Datacenter VM (size right now doesn't matter much -- I chose Standard DS1 to keep costs down) called PRM-DAT-AAA based on the PRM-DAT resource group, the prmdataaastorageaccount storage account and the prmvirtualnetwork that was created at the beginning of this blog series as the common virtual network for all VMs. Don't enable monitoring. In Public IP addresses locate PRM-DAT-AAA and under configuration set the DNS name label to prm-dat-aaa. In Network security groups locate PRM-DAT-AAA and add the following tag: displayName : NetworkSecurityGroup. In Network interfaces locate PRM-DAT-AAAnnn (where nnn represents any number) and add the following tag: displayName : NetworkInterface. In Public IP addresses locate PRM-DAT-AAA and add the following tag: displayName : PublicIPAddress. In Storage accounts locate prmdataaastorageaccount and add the following tag: displayName : StorageAccount. In Virtual machines locate PRM-DAT-AAA and add the following tag: displayName : VirtualMachine. In the Web Portal navigate to your team project and add a new Git repository called Infrastructure. In Visual Studio clone the new repository to a folder called Infrastructure at your preferred location on disk. 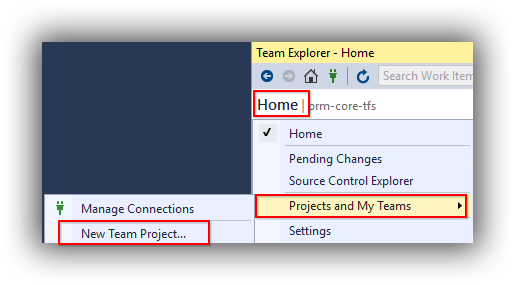 Create a new Visual Studio Solution (not project!) called Infrastructure one level higher then the Infrastructure folder. This effectively stops Visual Studio from creating an unwanted folder. 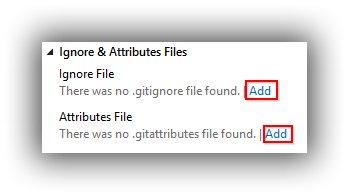 Add .gitignore and .gitattributes files and perform a commit. 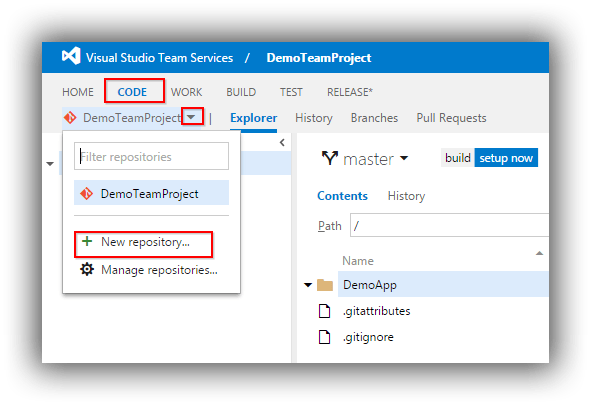 Add a new Visual Studio Project to the solution of type Azure Resource Group called DeploymentTemplates. When asked to select a template choose anything. Delete the Scripts, Templates and Tools folders from the project. 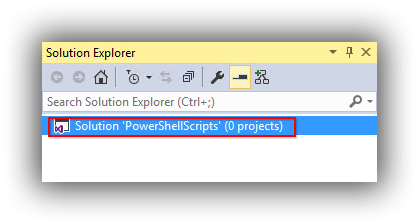 Add a new project to the solution of type PowerShell Script Project called DeploymentScripts. Delete Script.ps1 from the project. In the DeploymentTemplates project add a new Azure Resource Manager Deployment Project item called WindowsServer2012R2Datacenter.json (spaces not allowed). 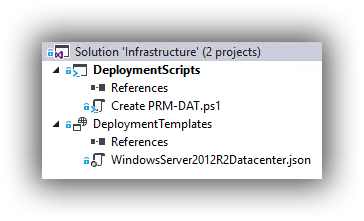 In the DeploymentScripts project add a new PowerShell Script item for the PowerShell that will create the PRM-DAT resource group with a PRM-DAT-AIO server -- I called my file Create PRM-DAT.ps1. Perform a commit and sync to get everything safely under version control. Running this code in Visual Studio should result in a successful outcome, although admittedly not much has happened because the resource group already existed and the deployment template is empty. Nonetheless, it's progress! This results in boilerplate JSON being added to the template along with a variable for actual storage account name and a parameter for account type. We'll use a variable later but for now delete the variable and parameter that was added -- you can either use the JSON Outline window or manually edit the template. Save the template and switch to Create PRM-DAT.ps1 to run the deployment script which should create the storage account. You can verify this either via the portal or the explorer. Note that you'll need to separate this resource from the storage account resource with a comma to ensure the syntax is valid. 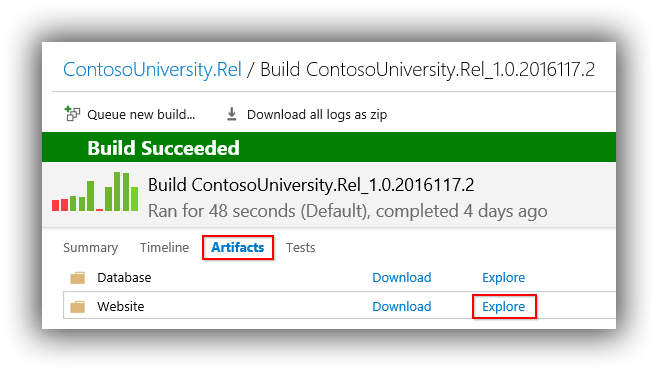 Save the template, run the deployment and refresh the Azure Resource Explorer. You can now compare the new PRM-DAT-AIO and PRM-DAT-AAA network security groups in the explorer to validate the JSON that creates PRM-DAT-AIO. Note that by zooming out in your browser you can toggle between the two resources and see that it is pretty much just the etag values that are different. The next resource to add is a public IP address. This can be added from the JSON Outline window using PublicIPAddress as the name but it also wants to add a reference to itself to a network interface which in turn wants to reference a virtual network. We are going to use an existing virtual network but we do need a network interface, so give the new network interface a name of NetworkInterface and the new virtual network can be any temporary name. As soon as the new JSON components have been added delete the virtual network and all of the variables and parameters that were added. All this makes sense when you do it -- trust me! The edited JSON for the network interface should look similar to the code that follows, but note I've replaced my MSDN subscription GUID with an ellipsis. It's worth remembering at this stage that we're hard-coding references to other resources. We'll fix that up later on, but for the moment note that the network interface needs to know what virtual network subnet it's on (created in an earlier post), and which public IP address and network security group it's using. Also note the dependsOn section which ensures that these resources exist before the network interface is created. At this point you should be able to run the deployment and confirm that the new resources get created. Running the deployment now should result in a complete working VM which you can remote in to. # Deletes all resources in the resource group!! The template will always create a Windows Server 2012 R2 Datacenter VM, but obviously the name of the VM needs to be specified. I want to restrict my VMs to small sizes to keep costs down. I'm happy for the VM username to always be the same so this can be hard-coded in the template, whilst I want to pass the password in as a parameter. I'm adding my VMs to an existing virtual network in a different resource group and I'm making a concious decision to hard-code these details in. I want the names of all the different resources to be generated using the VM name as the base. nodeName parameter -- this is used via variable conversions throughout the template to provide consistent naming of objects. My node names tend to be of the format used in this post and that's the only format I've tested. Beware if your node names are different as there are naming rules in force. nodeNameToUpper variable -- used where I want to ensure upper case for my own naming convention preferences. nodeNameToLower variable -- used where lower case is a requirement of ARM eg where nodeName forms part of a DNS entry. vmSize parameter -- restricts the template to creating VMs that are not going to burn Azure credits too quickly and which use standard storage. storageAccountName variable -- creates a name for the storage account that is based on a lower case nodeName. networkInterfaceName variable -- creates a name for the network interface based on a lower case nodeName with a number suffix. virtualNetworkSubnetName variable -- used to create the virtual network subnet which exists in a different resource group and requires a bit of construction work. vmAdminUsername variable -- creates a username for the VM based on the nodeName. You'll probably want to change this. vmAdminPassword parameter -- the password for the VM passed-in as a secure string. resourceGroup().location resource function -- neat way to avoid hard-coding the location in to the template. Of course, these refactorings shouldn't affect the functioning of the template, and tearing down the PRM-DAT resource group and recreating it should result in the same resources being created. What about Environments where Multiple VMs are Required? Unfortunately it seems like this idea is a dud -- see here for the details. Instead the technique appears to be to use the copy, copyindex and length features of ARM templates as documented here. This necessitates a minor re-write of the template to pass in and use an array of node names, however there are complications where I've used variables to construct resource names. At the time of publishing this post I'm working through these details -- keep an eye on my GitHub repository for progress. Before actually wrapping-up I'll make a quick mention of the template's outputs node. A handy use for this is debugging, for example where you are trying to construct a complicated variable and want to check its value. I've left an example in the template to illustrate. 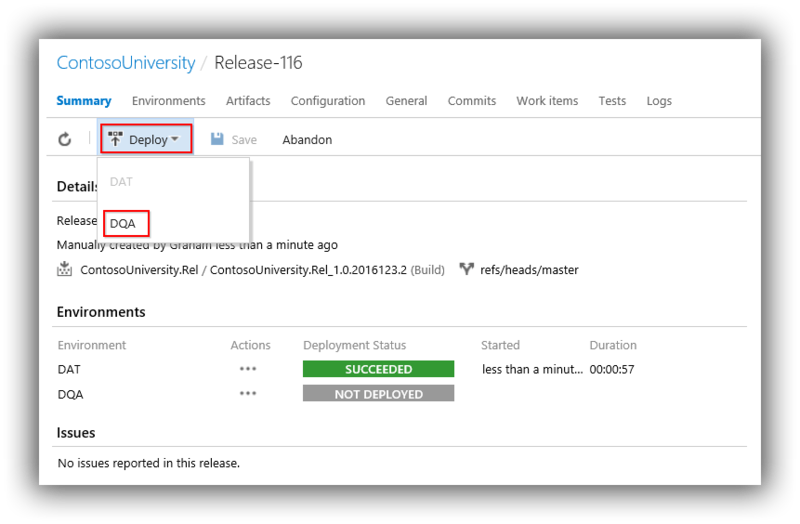 In this instalment of my blog post series on Continuous Delivery with TFS / VSTS we configure a continuous integration (CI) build for our Contoso University sample application using Team Foundation Build 2015. 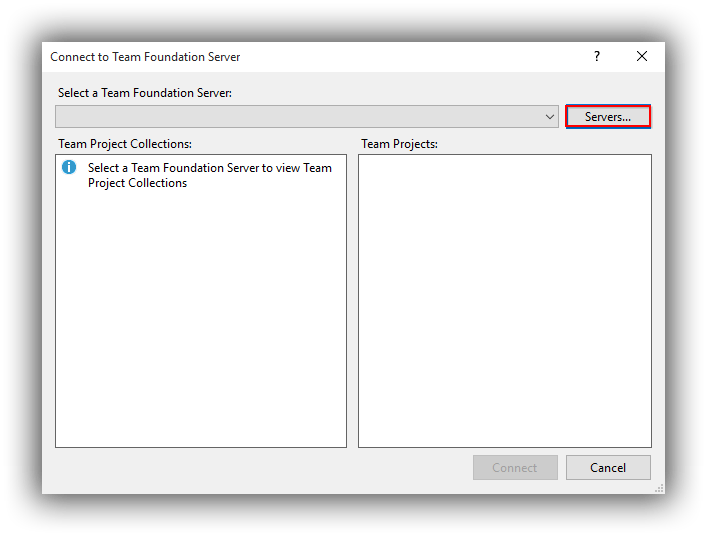 Although the focus of this post is on explaining how to configure a build in TFS or VSTS it is worth a few words on the bigger picture as far as builds are concerned. One important aspect to grasp is that for a given application you are likely to need several different builds for different parts of the delivery pipeline. The focus in this post is a CI build where the main aim is the early detection of problems and additional configurations that help bake quality in. The output from the build is really just information, ie feedback. We're not going to do anything with the build itself so there is no need to capture the compiled output of the build. This is just as well since the build might run very frequently and consequently needs to have a low drain on build server resources. In addition to a CI build a continuous delivery pipeline is likely to need other types of build. 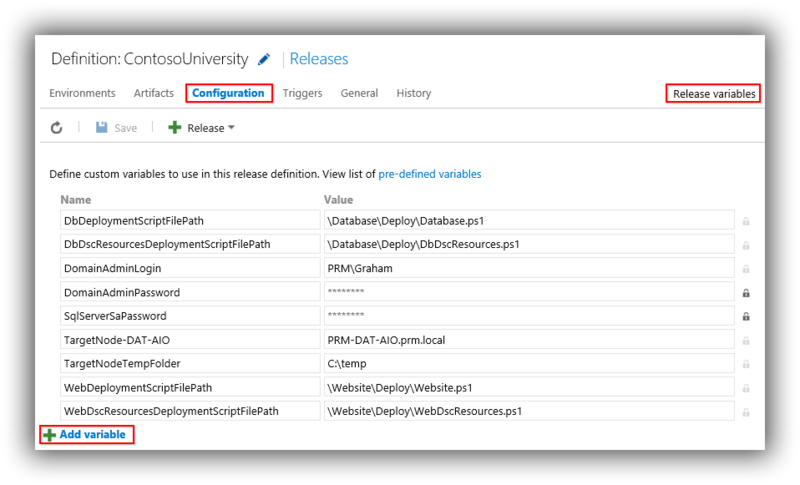 These might include one to support technical debt management (we'll be looking at using SonarQube for this in a later post but look here if you want a sneak preview of what's in store) and one or more that capture the compiled output of the build and kick-off a release to the pipeline. Before we get going it's worth remembering that as far as new features are concerned VSTS is always a few months ahead of TFS. Consequently I'm using TFS to create my CI build as it's the lowest common denominator. If you are using VSTS you can obviously follow along but do note that screenshots might vary slightly. It's also worth pointing out that starting with TFS 2015 there is a brand new build system that is completely different from the (still supported) XAML system that has been around for the past few years. The new system is recommended for any new implementations and that's what we're using here. If you want to learn more I have a Getting Started blog post here. There are many items that can be configured across the different tabs but I'm restricting my explanation to the ones that are not pre-populated and which required. 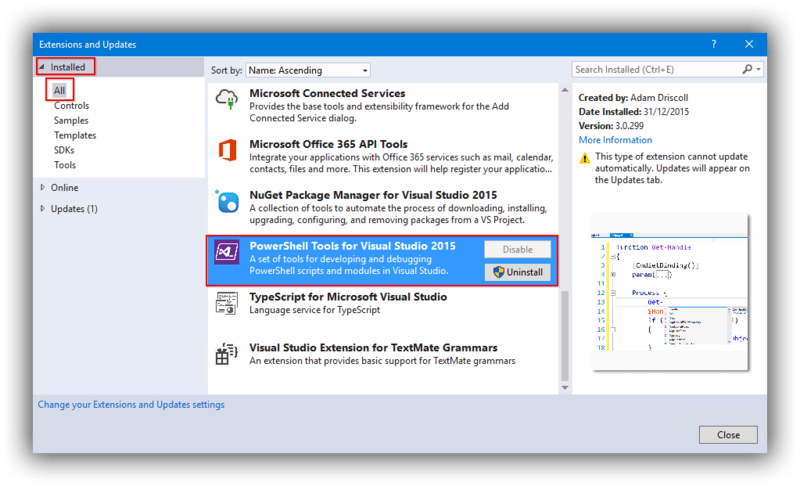 You can find out more about the Visual Studio Build task here. Platform relates to whether the build should be x86, x64 or any cpu. Whilst you could specify a value here the recommendation is to use a build variable (defined under Variables -- see below) as Platform is a setting used in other build tasks. An additional advantage is that the value of the variable can be changed when the build is queued. As per the documentation I specified $(BuildPlatform) as the variable. Configuration is the Visual Studio Solution Configuration you want to build -- typically debug or release. This is another setting used in other build tasks and which warrants a variable and I again followed the documentation and used $(BuildConfiguration). Clean forces the code to be refreshed on every build and is recommended to avoid possible between-build discrepancies. Clean here appears to be the same as Clean on the Build tab. Not sure why there is duplication or why it is a check box on the Build tab and a dropdown on this tab but set it to true. Add a variable named BuildPlatform, specify a value of any cpu and check Allow at Queue Time. 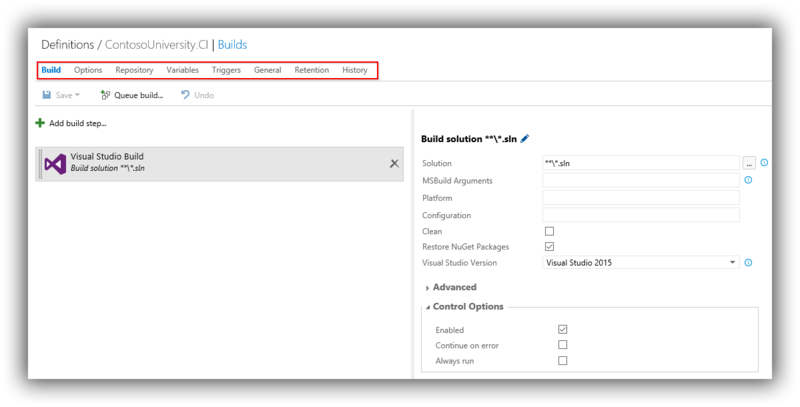 Add a variable named BuildConfiguration, specify a value of release and check Allow at Queue Time. Continuous Integration should be checked. At the moment our build doesn't have a name, so to fix that first head over to the Variables tab and add MajorVersion and MinorVersion variables and give them values of 1 and 0 respectively. Also check the Allow at Queue Time boxes. Now on the General tab enter $(BuildDefinitionName)_$(MajorVersion).$(MinorVersion).$(Year:yyyy)$(DayOfYear)$(Rev:.r) in the Build number format text box. Save the definition and queue a new build. The name should be something like ContosoUniversity.CI_1.0.2016019.2. One nice touch is that the revision number is reset on a daily basis providing an easy way keep track of the builds on a given day. At this point we have got the basics of a CI build configured and working nicely. In the next post we look at further configurations focussed on helping to bake quality in to the application. If you are interested in buying a book which covers TFBuild 2015 then I can recommend Continuous Delivery with Visual Studio ALM 2015. I've read it and it's excellent. 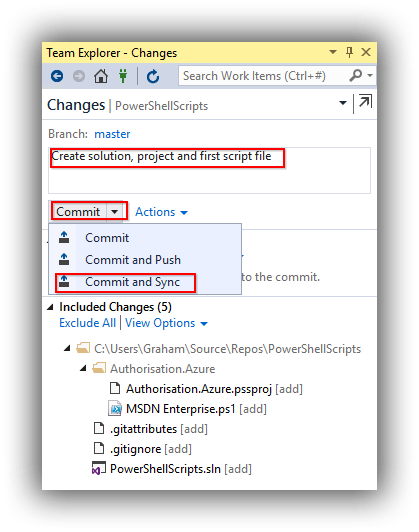 In this instalment of my blog post series on Continuous Delivery with TFS / VSTS we configure a sample application to work with Git in Visual Studio 2015 and perform our first commit. This post assumes that nothing has changed since the last post in the series. Complete the form as you see fit. 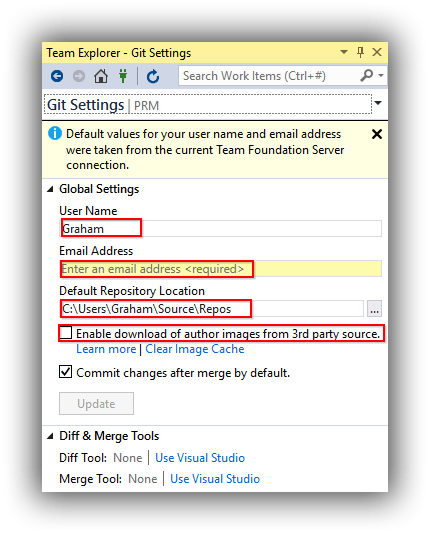 The one change I make is to trim Repos from the Default Repository Location (to try and reduce max filepath issues) and then from Windows Explorer create the Source folder with child folders named GitHub, TFS and VSTS. This way I can keep repositories from the different Git hosts separate and avoid name clashes if I have a repository named the same in different hosts. 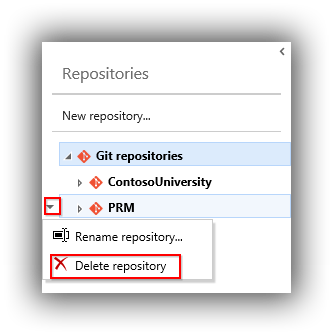 In the previous post we created ContosoUniversity (the name of the sample application we'll be working with) repositories in both TFS and VSTS. Before we go any further we need to clone the ContosoUniversity repository to our development workstation. 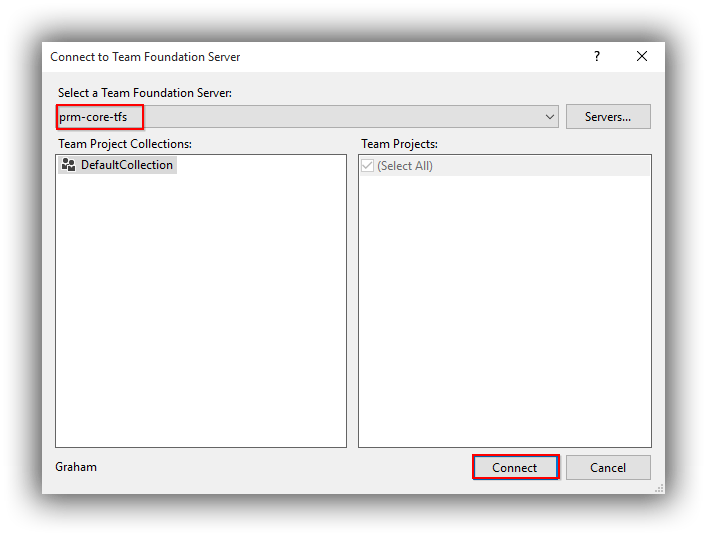 Make sure you change the local settings to the correct folder structure (if you are following my convention this will be ...\Source\TFS\ContosoUniversity) and click on Clone. Finally, return to the Web Portal and delete the PRM repository. 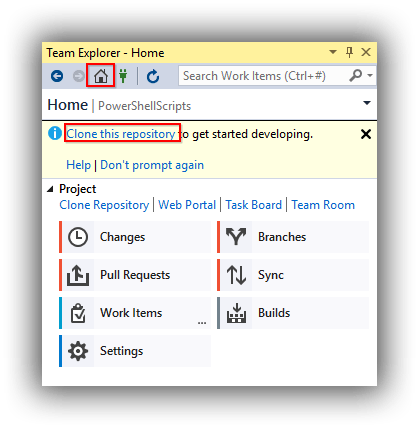 With your VSTS subscription added you will eventually end up back at the Team Explorer -- Home page where you can clone the repository as for TFS but with a local path of ...\Source\VSTS\ContosoUniversity. The Contoso University sample application I use is an ASP.NET MVC application backed by a a SQL Server database. It's origins are the MVC Getting Started area of Microsoft's www.asp.net site however I've made a few changes in particular to how the database side of things is managed. I'll be explaining a bit more about all this in a later post but for now you can download the source code from my GitHub repository here using the Download ZIP button. Once downloaded unblock the file and extract the contents. Now switch back to Windows Explorer and the extracted Contoso University, and drill down to the folder that contains ContosoUniversity.sln. 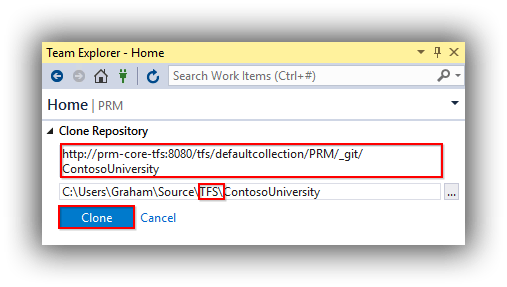 Delete .gitattributes and .gitignore and then copy the contents of this folder to ...\Source\TFS\ContosoUniversity or ...\Source\VSTS\ContosoUniversity depending on which system you are using. You should end up with ContosoUniversity.sln in the same folder as .gitattributes and .gitignore. Click on Add All and then Commit and Sync these changes as per the procedure described above. That's it for this post. Next time we open up the Contoso University solution and get it configured to run.